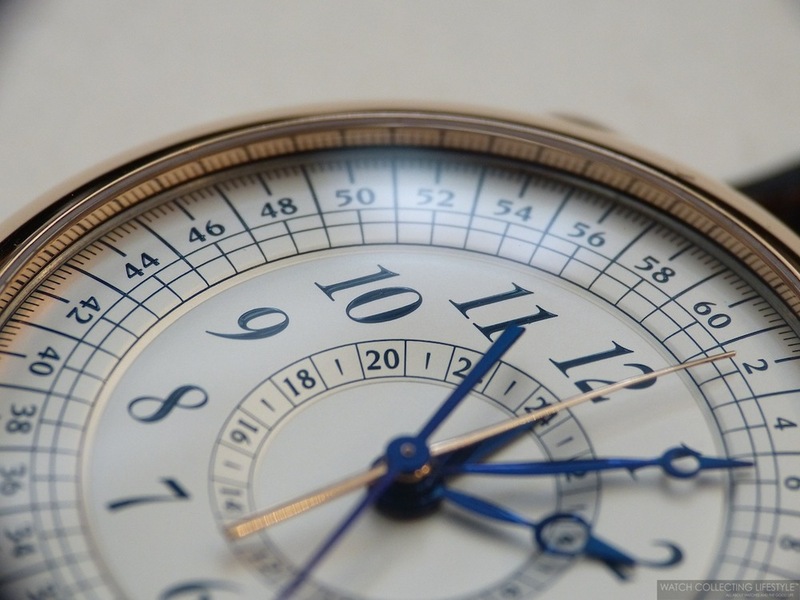 The first Chronograph from De Bethune came out in 2006 and it was an instant sensation with its five central hands. In 2014, the DB29 Maxichrono Tourbillon came out and then in 2017, it was revisited as the DB28 Maxichrono. This year at Baselworld 2019, a new iteration of the Maxichrono made its appearance with the DB21 Maxichrono Re-Edition in a limited edition of 10 pieces. One of our favorite mono-pusher chronographs out there, the De Bethune DB21 Maxichrono features a mono-pusher 24-hour chronograph with five hands on the central pinion and concentric chrono totallizers that go all the way from the center of the dial to the periphery. Posted on March 27, 2019 by Editor & Publisher and filed under De Bethune, Baselworld 2019, Baselworld and tagged De Bethune Calibre DB2030 De Bethune DB28 Maxichrono ref. DB28MCRZN Independent Brands Chronographs De Bethune De Bethune DB21 Maxichrono Re-Edition DB21 Maxichrono Re-Edition 2019 Baselworld Baselworld 2019 Most Popular. If you are a regular to our website, De Bethune needs no introduction. Last week, we brought you the news about one of the two novelties unveiled by the brand at Baselworld 2018 after a couple of years without releasing any new watches. 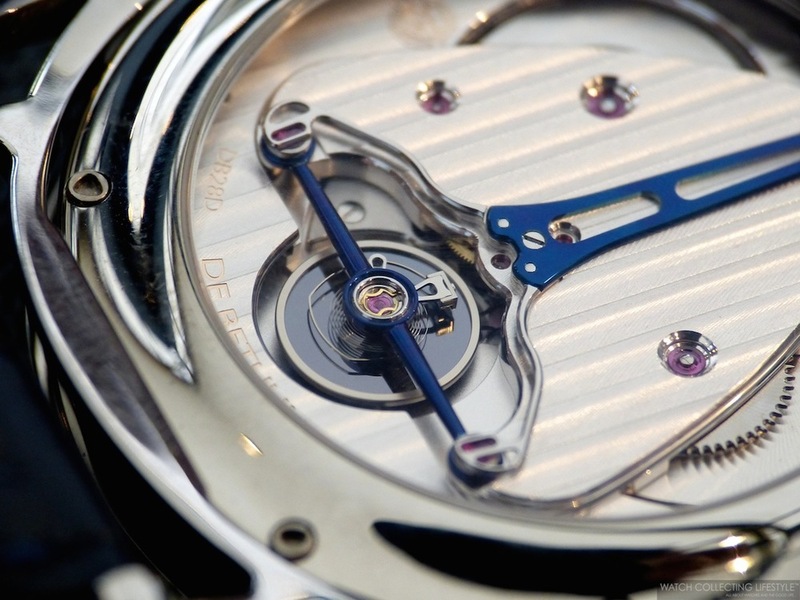 The first watch released after their hiatus was the De Bethune DB28 Steel Wheels. Now, along with the new DB27 Titan Hawk V2 we brought you here, the brand has released a watch that takes its inspiration from the DB25T Milky Way with a star-studded dial like no other. Posted on April 10, 2018 by Editor & Publisher and filed under De Bethune and tagged De Bethune DB25 Starry Varius De Bethune Independent Brands Independents Time Only Celestial Watches 2018 Most Popular. After a couple of years without releasing any novelties, De Bethune made a come back last January 2018 with the release of the DB28 Steel Wheels. A week ago at Baselworld 2018, De Bethune added two new pieces to their lineup and one of them is the new DB27 Titan Hawk V2 we have here and its sibling with silvered white dial. While the new De Bethune DB27 Titan Hawk V2 is the new 'entry level' watch for this manufacture, the design and finishes clearly embrace the principles and values of the manufacture without cutting any corners. Posted on April 2, 2018 by Editor & Publisher and filed under De Bethune, Baselworld 2018, Baselworld and tagged De Bethune Baselworld Baselworld 2018 De Bethune DB27 Titan Hawk V2 2018 Independents Independent Brands Time Only Watches Most Popular. Today, we bring you another exceptional timepiece for your reading and viewing pleasure. The De Bethune DB28 Maxichrono ref. DB28MCRZN is one of our favorite 'monopoussoir' —mono-pusher— chronographs along with the De Bethune DB29 Maxichrono Tourbillon —reviewed by us here— and the Blancpain Villeret Chronographe Monopoussoir reviewed here. Posted on November 20, 2017 by Editor & Publisher and filed under De Bethune and tagged De Bethune DB28 Maxichrono De Bethune Calibre DB2030 De Bethune DB28 Maxichrono ref. DB28MCRZN Top Brands 2017 Independent Brands Chronographs Most Popular. Originally launched in 2014 with a grade 5 titanium case, the latest iteration of the De Bethune DW5 Dream Watch 5 features a tourbillon and a full meteorite case from 'Campo del Cielo' in Argentina. 'Campo del Cielo' is an area located about 620 miles —1,000 kilometers— northwest of Buenos Aires, that holds the largest number of iron meteorite fragments in the world and is also the site where the two largest meteorites ever recovered on earth where found—100 tons and 37 tons respectively. Posted on June 20, 2016 by Editor & Publisher and filed under De Bethune and tagged De Bethune Dream Watch 5 Meteorite De Bethune DW5 De Bethune Most Popular. In 2002, when David Zanetta, a collector with a passion for art, history and timepieces, decided to join forces in founding De Bethune with Denis Flageollet, a fourth generation descendant of watchmakers. Each year for a few hundred fortunate connoisseurs around the world, De Bethune offers models enshrining the quintessence of mechanical horology and captivating designs like the one we have here. This time, we take a closer hands-on look at the De Bethune DB28 GS Grand Sport with a new blue natural rubber strap and a 300ft —100 meters— water resistance, making it an ideal timepiece for Spring or Summer. Posted on March 4, 2016 by Editor & Publisher and filed under De Bethune and tagged De Bethune DB28 GS Grand Sport De Bethune DB28 Grand Sport Most Popular. This year, was the first year that the Fondation de la Haute Horlogerie invited some of the independent brands into the 26th edition of the SIHH 2016 Salon International de la Haute Horlogerie Genève. In a new section named the 'Carré des Horlogers', nine top independent brands —artisan-creators as referred to by the SIHH— had the opportunity to show their novelties for the very first time at the Salon. Posted on February 2, 2016 by Editor & Publisher and filed under De Bethune, SIHH 2016, SIHH and tagged De Bethune DB25 World Traveler SIHH SIHH 2016 De Bethune Most Popular. Inspired by the cues of the De Bethune DB25 Quetzalcoatl released last year, this unique piece made on commission by De Bethune for Berger Joyeros in Mexico City, is truly a gem in all the sense of the word. Featuring an 18K white gold case measuring 44 mm in diameter by 12.50 in thickness, the De Bethune Mexican Civilization Unique Piece brings the best in hand engraving with a strong mesoamerican twist. Posted on January 6, 2016 by Editor & Publisher and filed under De Bethune and tagged De Bethune DB25 Mayan Jade Dial De Bethune DB25 Mexican Civilization De Bethune Most Popular. Referred to as modern day alchemists, it has taken just eleven short years for two watchmaking devotees to build what history will doubtless view as the foundations of 21st century horology. In 2002, when David Zanetta, a collector with a passion for art, history and timepieces, decided to join forces in founding De Bethune with Denis Flageollet, a fourth generation descendant of watchmakers. Passion is at once the watchword, the winning formula and the reward for the constant personal commitment of these exceptional men. The De Bethune DB28 Dark Shadows clearly embraces the principles and values of the manufacture. Fitted with a sandblasted anthracite zirconium round shaped middle case with a diameter 42.60 mm and a thickness of 9.20 mm, the DB28 Dark Shadows features the traditional short and long floating lugs also in sandblasted anthracite zirconium. The finish of the middle case and the floating lugs is smooth and precise as good as it gets. The blackness of the case design along with the openworked dial create an endless symphony of avant-garde design. Posted on July 1, 2015 by Editor & Publisher and filed under De Bethune and tagged De Bethune DB28 Dark Shadows De Bethune Calibre DB 2115 Most Popular Top Brands. 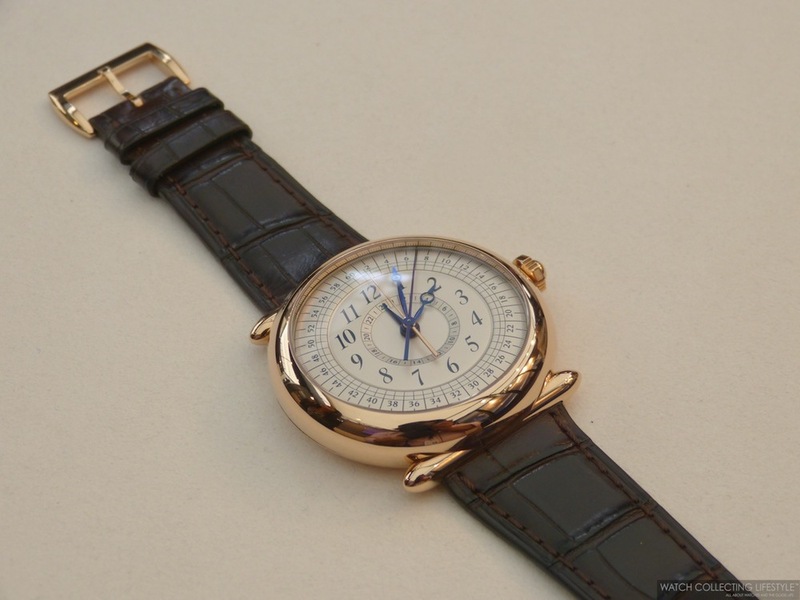 If you are a regular to our website, De Bethune needs little to no introduction. Just in case you're not, let's give you some basic background. In 2002, when David Zanetta, a collector with a passion for art, history and timepieces, decided to join forces in founding De Bethune with Denis Flageollet, the son, grandson and great-grandson of watchmakers. Not doing more, but instead doing better has been the guiding principle for their creations. Almost four years ago in November of 2011, De Bethune received the GPHG 'Aiguille d’Or' —Grand Prize at the Grand Prix d'Horlogerie de Genève. David Zanetta and Denis Flageollet, are now masterfully accompanied at the head of the company by Pierre Jacques. Today, their vision and philosophy has given birth to some of the most fascinating and understated horological creations we've seen in the last ten years. Such is the case of the recently launched De Bethune DB25T Zodiac, a tourbillon tailored for those in love with astronomy and those who allow their destiny to be guided by the zodiac signs and the constellations these represent. Posted on April 21, 2015 by Editor & Publisher and filed under De Bethune and tagged De Bethune DB25T Zodiac GPHG 2011 Top Brands. De Bethune is one of those 'haute horlogerie' manufactures that knocks it out of the park every time they release a new piece. As if the new De Bethune DB25 Quetzalcoatl —featured here— wasn't impressive enough, David Zanetta and the De Bethune team, decided to create a 10th anniversary DBS Tourbillon to be presented at Baselworld 2015. Ten years ago, David Zanetta and Denis Flageollet decided to support the 'Only Watch Project' —an auction placed under the patronage of Prince Albert II of Monaco on behalf of research into Duchenne Muscular Dystrophy— by creating the first DBS, an incredibly high-tech model with an innovative design. The white gold case of the DBS testified to a new thought process undertaken by the brand founders in terms of ensuring a wristwatch makes an ideally comfortable fit, and marked the start of in-depth work on forging a specific De Bethune functional aesthetic. Posted on April 3, 2015 by Editor & Publisher and filed under Baselworld, De Bethune, News and tagged De Bethune DBS Tourbillon 10th Anniversary De Bethune DBS Tourbillon Baselworld Baselworld 2015. Quetzalcoatl is a composite name in the Nahuatl language derived from 'quetzalli' and used to describe the large, precious green feathers of the sacred quetzal bird; and 'coatl', meaning snake. It is one of the main divinities of the Mesoamerican civilizations and the feathered serpent, its most iconic incarnation, reigned for many long centuries over pre-Columbian America. This powerful symbol of Mesoamerican culture was the core of worship and sacred rituals. The related myths and legends appear in the writings of the colonial period. In conjunction with the evening star, it was considered to govern the cycle of time from dawn to dusk. This deity of the summer winds was naturally closely associated with agriculture and in particular with corn farming, as well as being the sovereign protector of goldsmiths and artisans, and the inventor of the calendar. Posted on March 18, 2015 by Editor & Publisher and filed under Baselworld, De Bethune, News and tagged De Bethune DB25 Quetzalcoatl Baselworld 2015 Top Baselworld. Last week we presented to you the new DB28 Digitale by De Bethune here. 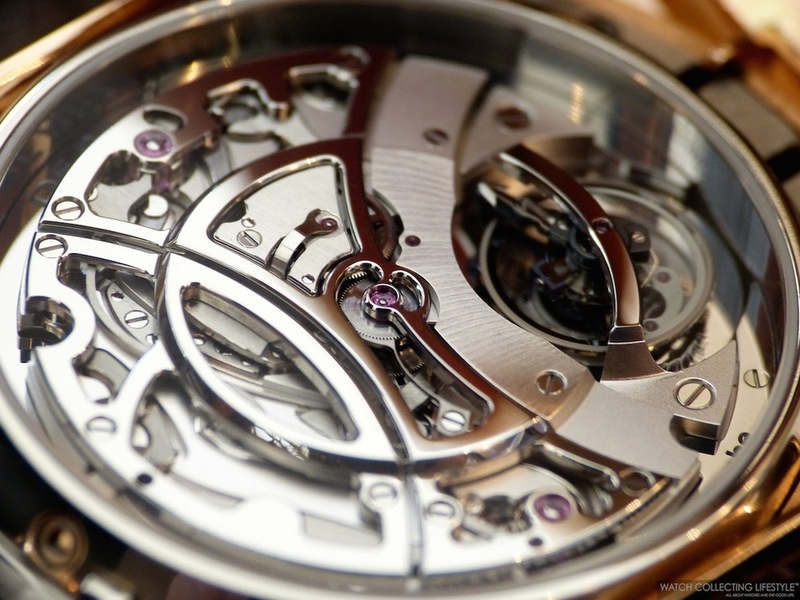 Today, we bring you another one of their exceptional novelties presented at Baselworld 2014. This time we are talking about the amazing De Bethune DB29 Maxichrono Tourbillon featuring a mono-pusher 24-hour chronograph with five hands on the central pinion and a 30-second indication tourbillon via the half hunter display case back. This new watch is fitted with a 5N rose gold case measuring 46 mm in diameter and 11.70 mm in thickness. The highly polished round case features cone-shaped lugs and a hinged half hunter case back that allows for full visibility of the movement and the tourbillon when opened via a very small push piece located below the winding crown. To round out the elegant look of this watch, De Bethune chose to fit it with an extra supple brown alligator strap with pin buckle. This exceptional timepiece features an amazing horological complication where all chrono functions are operated via a mono-pusher on the winding crown and where all chrono hands are located in the central pinion along with the hour and minute hands. The De Bethune DB29 Maxichrono Tourbillon is fitted with a very elegant and well balanced silver-toned dial that features four different levels to provide exceptional depth and a domed shape towards its perimeter to maximize readability. From the center to the periphery one can find the 24-hour central chrono register, a chapter ring with Arabic numerals to read the time and lastly a chapter ring with minute indicators for the chronograph minutes and seconds. The five central hands —four blued steel and one rose gold for the chrono minutes register— are perfectly curved on their tips and perfectly contrasting. While the hour and minute hands are Breguet style-shaped hands, the rest of the hands are needle type with the 24-hour chrono hand being the smallest of them all. Once you focus your attention to the half hunter solid case back on the watch and after pressing the small push-piece located right below the crown, a wonderful surprise and a real treat for the eyes awaits. As you open the half hunter case back, you can contemplate the fascinating manual-wound De Bethune calibre DB2039 with 30-seconds indication tourbillon. This in-house movement which is composed of 410 parts, 49 jewels and three column wheels is fully crafted and decorated by hand. The beating heart provides an outstanding power reserve of five full days. On the wrist, this watch is an absolute treat wearing slightly smaller than its actual size —due to the shape of its lugs— and very comfortably. One of the nicest touches on this watch is the lack of branding on the dial that makes it even more unique and exclusive. Only those watchlifestylers in the know, will be able to call you out on what brand you are wearing. This timepiece will be produced in a very small batch of 20 timepieces per year without being a limited edition watch 'per se'. Sticker Price 270,000 CHF ex VAT. 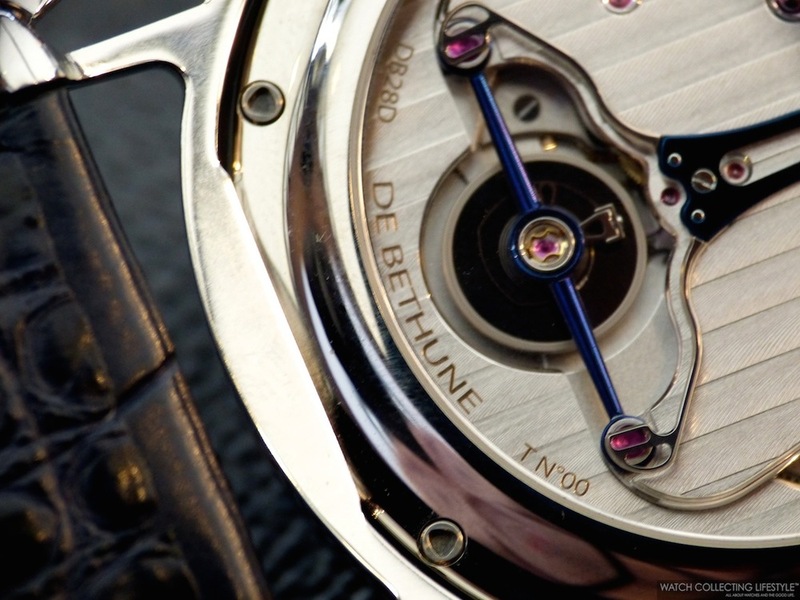 For more info on De Bethune click here. Posted on April 9, 2014 by Editor & Publisher and filed under Baselworld, De Bethune and tagged De Bethune DB29 Maxichrono Tourbillon De Bethune Calibre DB2039. Ever since the creation of De Bethune, 18th century fine watchmaking has been an inexhaustible source of inspiration for its founders, both of whom deeply admire and respect the mechanical ingenuity, the particularly refined aesthetic and the subtle elegance of French clocks from the Directory period. The DB28 Digitale, equipped with a mechanism powering multiple display modes —digital for the jumping hours and analogue for the minutes and spherical for the moon phases— embodies a highly contemporary vision of the aesthetic of that era. The watch fitted with a case measuring 43 mm in diameter and an outer bezel measuring 45 mm is a real treat for the eyes. The dial adorned with a hand-guilloché barleycorn motif, together with the spherical moon and the star-studded sky, represent classical references that are arranged and executed in a manner that accentuates the modernity of the design. The silver-toned guilloché motif reveals all the beauty and finesse of its motifs. The visual equilibrium of the dial stems from the central spherical moon of which the two polished hemispheres —one in palladium and the other in flame-blued steel— indicate the moon phases with a degree of precision corresponding to a difference of just one lunar day every 1,112 years. The peripheral depiction of the sky is spread from 9 and 3 o’clock above the minutes disc driven by a sophisticated micro-ball bearing mechanism that also powers the digital hours display. Like its dial, the polished titanium ultra-light case of the DB28 defines the modern and indeed futuristic nature of the DB28 Digitale. It is fitted with a 12 o’clock crown and equipped with a patented spring-based floating lugs system enabling millimeter-degree adjustment to the wrist and its movements. 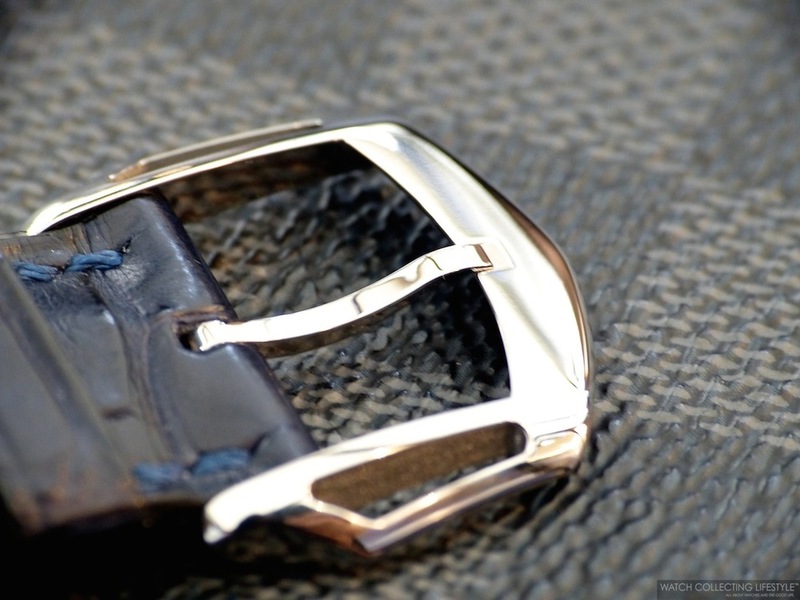 The back of the watch reveals the finishing and technology of a Manufacture De Bethune movement, featuring flame-blued steel parts and bridges adorned with a Côtes de Genève style motif, reworked to accentuate the way light is reflected on the material and to draw the eye towards the heart of the movement. 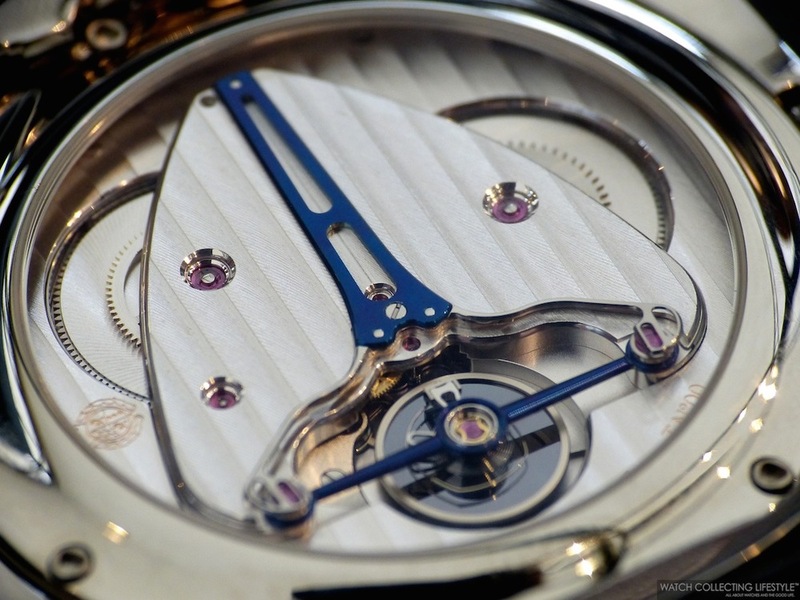 Several patents and innovations are displayed through this window onto the DB2144 calibre, notably equipped with the exclusive De Bethune self-regulating twin barrel, circular silicon/white gold balance wheel, balance-spring with flat end curve, as well as the triple pare-chute shock-absorbing system. The aesthetic balance and the readability of the DB28 Digitale, as well as the luminous shimmering effects created by the light playing across the material and its finishes, combine to create an atmosphere of gentle harmony imbued with refined elegance. 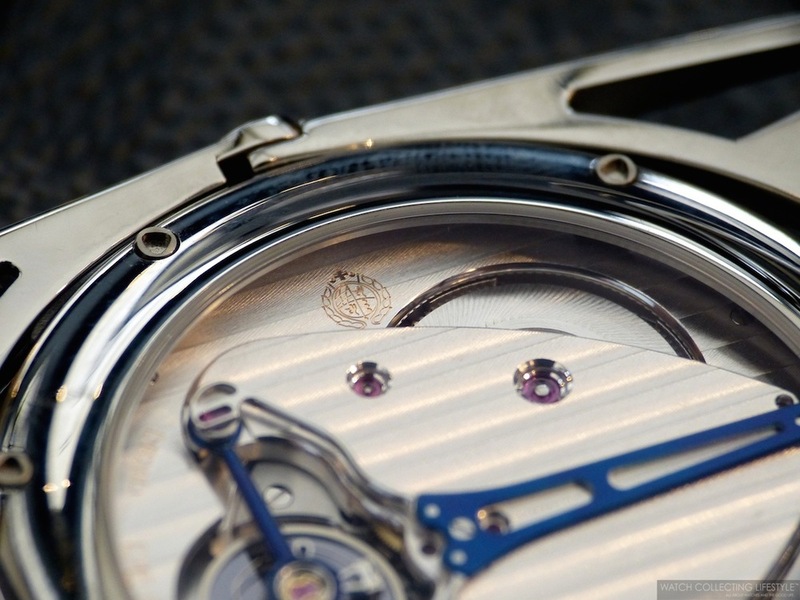 The movement provides a power reserve of 5 days when fully wound. Now, enjoy the rest of these live macro images we have prepared for you. This is a watch that will take your breath away and leave you in awe, as you find yourself admiring the dial and the movement. A watch with superb finishing, exceptional design and superior craftsmanship. Sticker Price 95,000 CHF ex VAT. 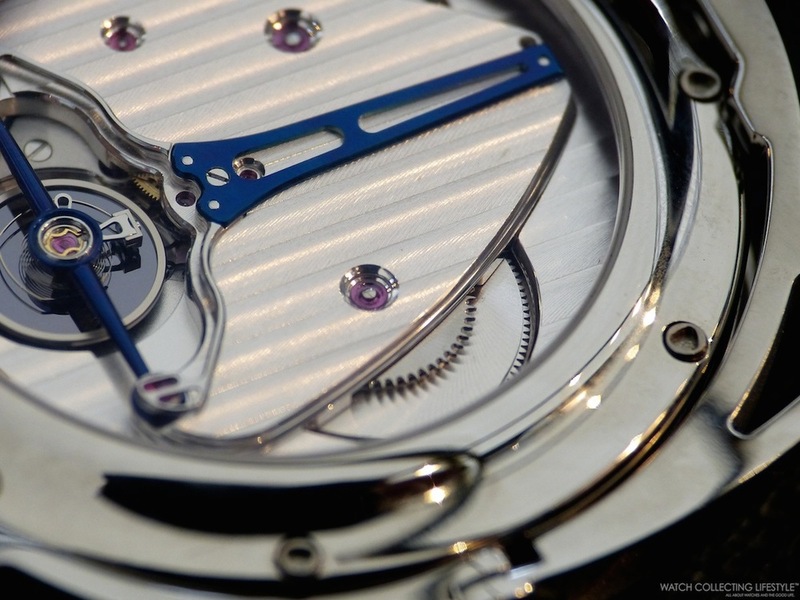 For more info on De Bethune click here. Posted on March 31, 2014 by Editor & Publisher and filed under Baselworld, De Bethune and tagged De Bethune DB28 Digitale De Bethune Baselworld.